She took another step closer and gasped. The firelight cleared the shadows around his features. She was not sure what she expected from an infamous smuggler but it was not this. Where were the pock marks? The scars? The missing teeth? There were no missing teeth to be sure. Though he kept his mouth in a firm line of disdain—or perhaps annoyance—the quick flash she had seen had revealed a mouth of perfectly healthy teeth. As for scars or pockmarks, his skin was perfect. His light brown hair was, admittedly, a little too long and his face was unshaven, revealing several days of neglect. There were shadows around his eyes too, and he looked weary. However, that could not take away from that fact he was a handsome man. She shook her head. Impossible. He had to help her. He was her only chance. She dragged out the chair opposite and sat. One dark brow rose at the action. Chin lifted, she propped her arms on the table and leaned forward. He smelled of the sea. She jerked back a little. Handsome he might be, but he was also intimidating. His strong jaw, finished with a slight dip that was just visible under the stubble, was set firmly. His eyes glinted in the firelight though she could not tell their color properly. She took a breath and cast her gaze over him. It was something she was in the habit of doing. Study everything closely enough and any fear she might have of it left. It had worked with spiders. When one looked closely, one could see they were no more than a few legs and a body pieced together. Those long legs no longer appeared so terrifying once she had seen them under a microscope and appreciated the unique design of the creatures. It did not seem to quite work with this creature. His slightly creased forehead and the still lifted brow did not lose any of it sternness. His lips, she concluded, were generous for a man’s, but it did not soften his appearance. She pictured him in evening wear and that helped a little, though she could tell he would be ridiculously handsome and likely still no more polite. “I was told you were the man to help me,” she said, aware of being a little breathless. 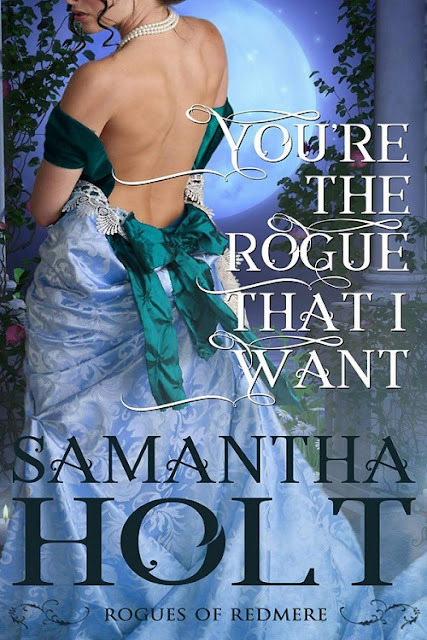 Samantha lives in a small village in England with her twin girls and a dachshund called Duke. She enjoys writing historical romance involving chivalrous knights, hot highlanders and cravatted men. Writing is her (more than) full time job but on the rare occasion, she's not writing, she loves to visit the many stately homes and castles nearby. Barbara is ready to ace her last year in high school. She was confident nothing could go wrong. She is serious, dedicated and extremely cautious of the popular students. Besides, she is also having fun being the elusive writer called Anonymous. After a certain article was published by “Anonymous”, Barbara never thought her life would take a whole different turn. Brandon is a popular student not only because he is good at sports, but because he is smart, considerate and the kind of guy every girl wants to date. He falls into the role as Barbara’s tennis coach. Little did he know, that 1) She was totally hopeless at tennis and 2) Barbara’s teacher had just assigned her to a new assignment – to get invited to the dance by Brandon. When the two meet, it wasn’t love at first sight. Crissten Shadow had the urge to write ever since she first picked up Enid Blyton books at the age of seven. Her first attempt started when she was 12 years old. An ardent reader of not only Enid Blyton, she grew up reading mysteries to science fiction and romance. Her favourite romance series are historical masquerades. She is involved full time in the aviation industry and travels widely. Writing is her hobby, among others. Being a missionary is also a priority for her. In her free time, she conducts writer’s workshop for young adults. Her series of publication also includes juvenile-mystery book that was published in 2009 and she will be releasing the next series soon. 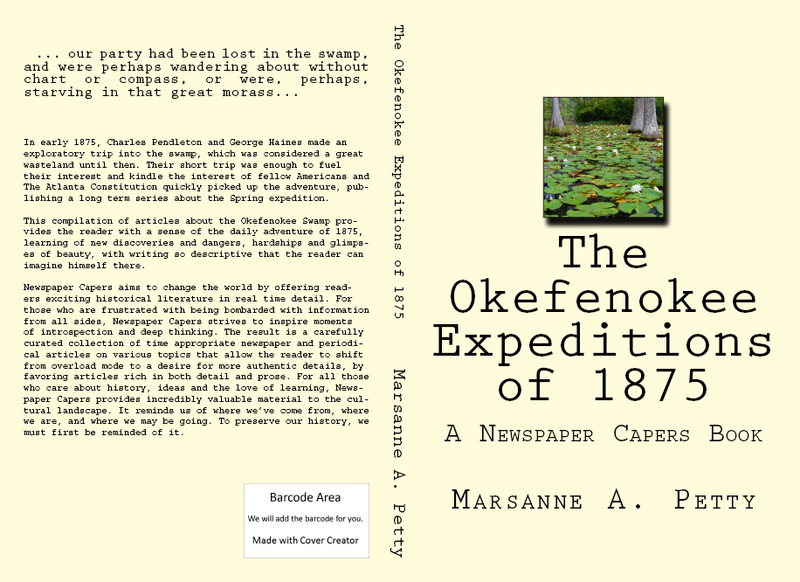 In early 1875, Charles Pendleton and George Haines made an exploratory trip into the swamp, which was considered a great wasteland until then. Their short trip was enough to fuel their interest and kindle the interest of fellow Americans and The Atlanta Constitution quickly picked up the adventure, publishing a long term series about the Spring expedition. When Clinch county was surveyed off into lots, this section was considered worthless, and hence nothing but district lines have been run, and the land is the property of the state, in common with the Okefinokee swamp. Still there are some good lands in spots, and there are settlers on it. 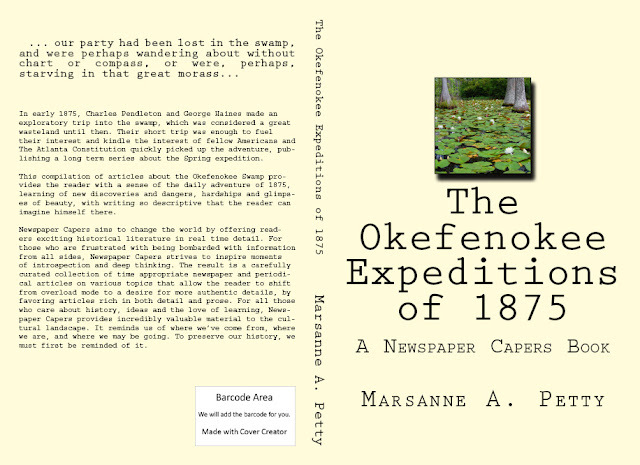 For a distance of five miles we traveled on a narrow ridge of land lying between the Okefinokee and what is known as Indian Swamp. The indication of game is so plain here that Uncle Ben and myself resolved to go in advance of the wagon and “drive” along the swamp for deer. We walked several miles, but having no dogs, we failed to “jump” anything. As we were about to give up and resume our seats in the wagon, we saw a drove of hogs flying for their lives. “Are those wild hogs, Uncle Ben?” said I. We walked on some distance and kept one “eye skinned,” but saw no bear. We halted for the approach of the wagon and resumed our seats, which felt very comfortable. We had scarcely gone three hundred yards before Uncle Ben commanded a halt, and exclaimed in an excited but under tone, “yonder’s a bear, see ‘im – see ‘im?” I gathered my gun and made in the direction he pointed though I did not see him. Uncle Ben was soon up with me and said that he had disappeared behind a large cluster of gallberry bushes just on the edge of the swamp, that perhaps he had lain down there if he did not smell our scent. We approached the spot cautiously, but to our disappointment, bear had gone. We saw where he had been engaged in pulling up palmetto buds, and after pulling off the tender buds had thrown them down. At this season of the year they subsist mainly on this, and a species of wild grape which grows in great abundance in the Okefinokee swamp. Of the habits, etc., of this species of bear, I will speak more at length in a future letter. I mounted my position in the wagon and Uncle Ben walked ahead for the purpose of selecting a suitable ground for camping as night was near closing in, and it was apparent that we would not reach the Suwanee. In this immediate vicinity there had evidently fallen heavy rains within a few days past, as the ground was getting very wet and the ponds full of water – very unlike the section we had traveled through. Just as we were in the act of halting, two fine deer bounced up near the wagon and brought a shrill sniff of the nostril and then vanished in the darkness to westward. Our old boss said that they would not go far, and that as soon as the moon began to rise that they would be feeding, and that he and I must go fire hunting for them. We soon had a blazing fire on an old pine log, and Frank busy getting supper. While this was being done, Uncle Ben was busy arranging for the hunt. He cut a fat lightwood pole about six feet long and four inches thick, and split one end into splinters, and put it into the fire. Just before the moon began to rise we started out. Uncle Ben, after taking good notice of the stars led the way with the pole bounced on his shoulder – the burning end behind. I followed close behind with Boone’s gun, well loaded on my shoulder. My own was left behind because it had been damp during the day and I was afraid it would fail to fire – and the axe was in my left hand. 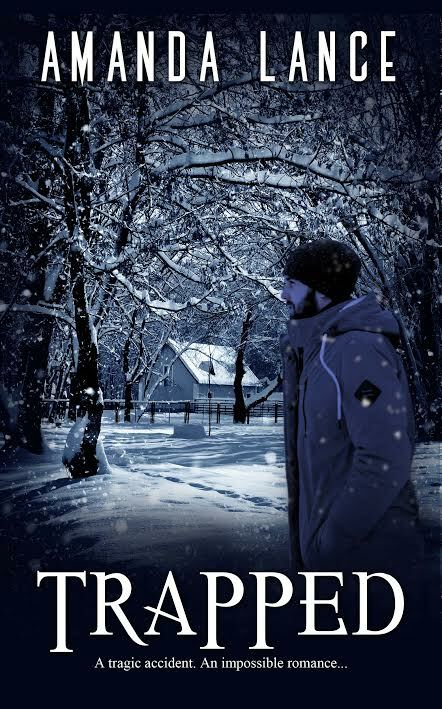 He walked slowly and cautionary, turning from one side to the other, swinging the fire in a half circle in order to keep it always behind his head. We had gone about a quarter of a mile when he stopped suddenly and gazed into the darkness ahead. I at once concluded that he “saw eyes” and so he did, for he motioned for me to step ahead, and as I did he showed me a pair that looked like two coals of fire. He whispered that we were not near enough and that I should temporarily resume my position behind. A few yards further and he beckoned me ahead. I obeyed his summons and I saw much more plainly the glaring eye-balls ahead. I leveled my gun and was in the act of fire when they disappeared. My hopes fell, but my comrade assured me that he would not go far. We went on about two hundred yards and Uncle Ben found the eyes again. This time we were afraid to venture as near as we did before, and I had to content myself with a shot at fifty yards. At the crack of the gun I staggered back against my friend and could hear nothing but a continued roaring in my ears. I thought that Tamp Fender’s mule had kicked me, or also that one of Jupiter’s thunderbolts had struck me on the shoulder. Uncle Ben caught me, but without stopping to see what was the matter was, ran on to yank, so he calls it, the wounded deer. I had loaded both barrels of the gun rather heavily, and being unaccustomed to its tricks, I cocked both hammers in order to get a second shot in case the deer did not get off too rapidly, and when I pulled one trigger both hammers fell simultaneously, and the result was a severe “kick,” skinned lip, two teeth knocked loose, and a headache for twenty-four hours. Uncle Ben failed to get to the scene of the action in time. Though I had shot the deer down, and blood was seen on the grass, it recovered enough to escape in the surrounding darkness. We returned to our camp and found the boys anxiously awaiting our return. They had heard the terrible explosion, and Boone amused at the prank his gun had played on me. He said it was an old trick. After this I used my own shooting iron exclusively, and was more fortunate, as I will subsequently show. My name is Marsanne Petty, and it might be a sin... but I'm a researcher through and through. I chase obscure topics into the end of oblivion and compile what I find for all to read. Sometimes my family thinks I'm crazy, but my dogs are good with it. If you want to follow me down the rabbit hole, check out my author page at www.amazon.com/author/marsannepetty. If you want some great oddities in your own mail box, shoot me an email at newspapercapers@gmail.com.